A Velux conversion is an ideal loft conversion for a loft that isn’t that big in size. The conversion process has Velux windows installed into the sloped rooftops. This kind of conversions aren’t limited and can be installed into any roof type, which makes them a very popular option when looking for an attic conversion. A Velux conversion can take up to approximately 2-4 weeks to fully install. This type of conversion is great as it lets a substantial amount of natural light enter the room. A loft conversion that's only light source is artificial light can often give off a dreary atmosphere and can often feel secluded from the world outside of the room. Velux loft conversions can be quite cost-effective as it is very possible to find cheap Velux windows that serve their job well. Velux window prices can vary, however, depending on the style and quality you go for. 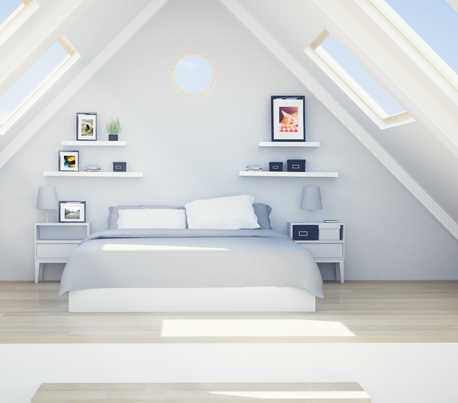 Installing Velux windows into your loft conversion are also very cost effective as they provide the room with a good amount of light, so there is a reduced amount of reason to use electric lights when functioning around the room. This loft conversion is great for transforming your attic into an open plan room such as a bedroom or in-house library. The open plan nature allows for maximum practicality with the space that’s already there. All you’ll need to do will be to install furniture and the room is good to go. The large Velux windows provide the room with enough light to keep the room lit up from sunrise to sunset. If you’re not a fan of having a constant stream of sunlight in your house or are worried about keeping your privacy, Velux blinds are a good solution for this. The blinds give you the ultimate control over how much light you want entering your room. You can also invest in some Velux blackout blinds, which stops all light completely from entering your room. Meaning you can sleep peacefully knowing the sunrise won't interrupt your rest time. 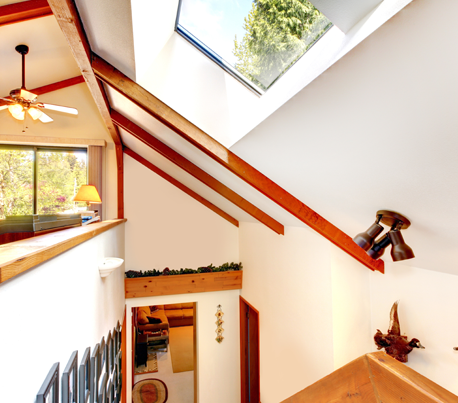 It is possible to get flat roof Velux windows, which can best be described as a skylight window for your home. People wonder how much Velux windows cost, and the prices can vary depending on the size of the window, the type of installation and the service fee requested. It is reported that they can start from around £900, but can rise depending on the factors mentioned. Because the process only involves making an alteration to the existing roof (Installing Velux windows), there is no need to request planning permission when making an installation.